Our Medicaid Budget: Are We Just Putting Lipstick on an 800 lbs. Pig? Too often, I have heard an analogy about the Medicaid budget and a pig wearing lipstick. Normally it goes like this: “Are we just putting lipstick on an 800 lb. pig?”…and the Medicaid budget is the 800 lbs. pig, not the lipstick. 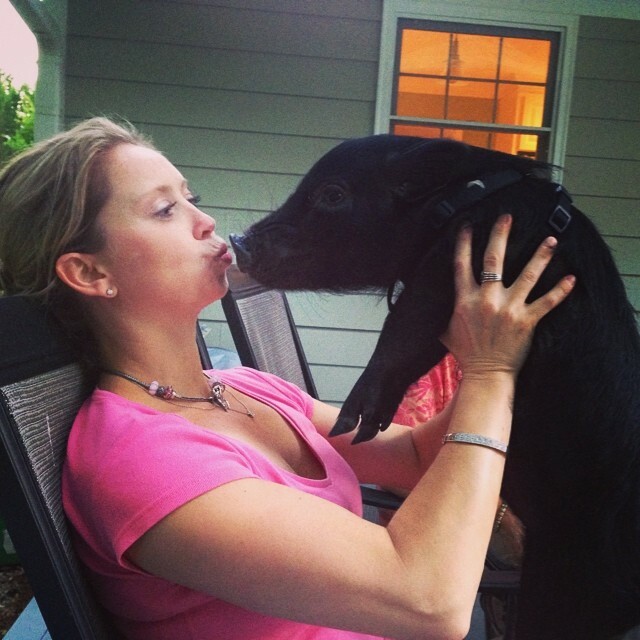 For those of you who do not know, I own a pet pig. She is a micro pig. Not a pot belly pig; those get to be 150 lbs. Oh, no. A micro pig; those stay very small. Our Oink is only 21 pounds. I understand that saying to put “lipstick on a pig” is a rhetorical expression. An expression used to demonstrate that making a superficial or cosmetic change is a futile attempt to disguise the true nature of a product. However, Oink and I take offense, because she is so much more beautiful than the Medicaid budget (and much smaller). Although my Oinky-Oink is only 21 pounds. The expression that I have heard most often involves an 800 lbs. pig. If our Medicaid budget were Oink’s size, the General Assembly would probably be home. How can we expect the General Assembly to create a “knowable” and “concrete” Medicaid budget when the Department of Health and Human Services (DHHS) cannot provide the General Assembly with accurate data? Literally, DHHS cannot tell the General Assembly how many people are enrolled in Medicaid. Legislatures are being told to guesstimate. Guesstimate??? Between 2009-2012, North Carolina exceeded its approved Medicaid budget by 5.4 billion. In the last decade, our Medicaid spending has increased by more than 90%. Not to mention DHHS has difficulty filling and retaining employees. Attrition is prominent. As of June 1, 2014, a quarter of the division’s 332 jobs were vacant; the average unfilled job had been open for 347 days, or nearly a year. In November, DHHS’ chief financial officer sent out a cry for help. The Medicaid office “does not have adequate staff with the necessary experience and skills to properly manage the … program,” Rod Davis wrote to the state budget office. To compensate for too few employees, DHHS gave a no-bid contract to Alvarez & Marsal to help create a Medicaid budget. We all know how that turned out. With the help of Alvarez & Marsal, DHHS proposed to tax the then-10 managed-care organizations (MCOs) that manage Medicaid services for mental health, developmentally disabled, and substance abuse. But we needed approval by the feds. It was DHHS’ hope that the extra funds would be the catalyst for a federal match twice that size. Once we got the federal match, DHHS would refund the taxed dollars to the MCOs and use the federal money to pay for programs. Maybe I’m wrong, but the idea sounds like a “bait and switch.” Analogously, I have a client pay me $50,000 on January 31, 2015, the end of our fiscal year, only to refund it February 1, 2015. I would get credit for collecting the $50,000 in fiscal year 2014, but it was not a real collection. It was fake. Sen. Bob Rucho, R-Mecklenburg, said the information presented Wednesday should have been made available months ago, and he noted that it’s still not detailed enough for a forecast. “When will we get the numbers that we need to have so that we can have a good budget number?” asked Rucho. And his question is not an anomaly. He is not alone. “I’ve asked them every time I’ve had the opportunity, and I’m astounded that a $13 billion organization does not have budget numbers,” said Sen. Tommy Tucker (R-Waxhaw), one of the more outspoken members of the Joint Legislative Oversight Committee on Health and Human Services. Medicaid Chief Financial Officer Rod Davis told Senator Ralph Hise that his department has an idea of how much they’ve paid to providers, but that they can’t forecast what’s to come. “Would it be like saying we know what checks we wrote, we just don’t know what we’ve paid for,” Hise asked. Are we putting too much pressure on the General Assembly and not on DHHS? The General Assembly is responsible for creating a Medicaid budget. But how can we hold the General Assembly to create an accurate Medicaid budget if the “single state agency,” DHHS, charged with managing Medicaid cannot provide the General Assembly with accurate data??? Here is my political soapbox: We have a Republican General Assembly and we have a Republican governor. Shouldn’t the General Assembly and the governor be on the same side???? Perhaps it’s more than politics. Perhaps it’s more than a donkey and an elephant. Otherwise with a Republican General Assembly and a Republican Governor, there should be no tension between the “balance of the powers.” Yet there is. By the way, whoever created the saying “Are we just putting lipstick on an 800 lbs. pig?” obviously did not own a pig. 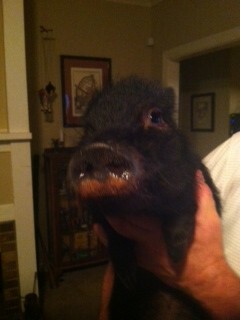 Because Oink did NOT enjoy getting lipstick on her snout. In fact, she squealed like a pig. The North Carolina State Medicaid Plan (State Plan) is constantly revised. The result of its constant revisions make for an 1800+ page, jumbled mess of plans, rules, amendments, and effective dates that make the State Plan as much fun to read as reading every volume of the Encyclopedia Britannica in Japanese with the aid of a Japanese translation dictionary. First of all, what the heck is the State Plan? Basically, a State Plan is a contract between a state and the Federal Government describing how that state administers its Medicaid program. It “assures” the federal government that we, here in NC, will follow the State Plan because the federal government has “blessed” our State Plan. Whenever we need to change the State Plan, we file an amendment. In circumstances that call for much greater deviation from the State Plan, we can apply for a Waiver…or an exception. Personal Care Services (PCS) are Medicaid-covered, in-home services to recipients “who have a medical condition, disability, or cognitive impairment and demonstrates unmet needs for, at a minimum three of the five qualifying activities of daily living (ADLs) with limited hands-on assistance; two ADLs, one of which requires extensive assistance; or two ADLs, one of which requires assistance at the full dependence level. The five qualifying ADLs are eating, dressing, bathing, toileting, and mobility.” See DHHS Website. In a letter dated September 30, 2013, and signed by Sec. Aldona Wos, DHHS sent what is called a SPA or a State Plan Amendment to the Centers for Medicare and Medicaid Services (CMS), in part, asking to be allowed to change the PCS unit rate from $3.88 to $3.28. It may not sound like a huge decrease in pay to you, but a 60 cent drop per unit will be extremely harmful to providers who provide PCS services and, ultimately Medicaid recipients because less providers will be willing to serve the population. One PCS unit is 15 minutes. There are 4 units in an hour. A 60 cent/unit cut to the rate will result in a $2.40 hourly cut. Providers who employ staff who provide PCS are not paying staff upwards of $20/hour. Oh, no, most PCS providers make, maybe, $7-9. Think about it…a small business provider of PCS (Let’s call it ABC Provider) employs 5-10 staff to provide PCS to recipients. ABC Provider has to pay its overhead (lease, office supplies, salaries of execs) plus pay the hourly wages of the PCS staff, and, supposedly, still make a profit…otherwise why even work? $2.40 has to be recouped somehow. Does the provider’s profit margin shrink or does the employee’s hourly rate decrease? Maybe a little of both. According to the September 30, 2013, Sec. Wos letter, NC DHHS requested a retroactive date for the PCS rate reduction to July 1, 2013, or, in the alternative, October 1, 2013. What? Retroactive reduced rates? Would DHHS recoup payments already made? As of the day of this blog, I have not found out whether CMS approved the SPA sent to CMS September 30, 2013. I looked on CMS’ website. So if anyone reading has information as to whether CMS approved, is approving, denied, or is denying the rate reduction, I, as well as other people, would be much obliged for the information.